Bernard and his two siblings were orphaned when their mother died in 2007 of unknown causes. The kids were left unprotected and destitute. Their aunt has been caring for them despite being illiterate and jobless. Begging became part of her daily life to help care for the children. Bernard’s aunt came to HHFL in 2011 seeking assistance. 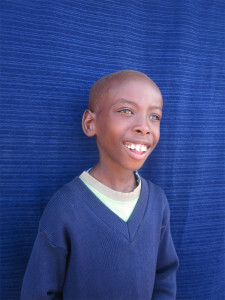 Bernard suffered from extreme malnutrition. His growth was stunted and his head was abnormally big. Bernard had no concentration and often dosed away on his desk. HHFL has provided him with medical care and proper nutrition over the last two years. Today, Bernard has grown a lot and his head has become proportionate to his size. He has become a very active boy who loves sports, especially soccer. His language abilities have improved greatly. He excels in number work and loves computer class.